Haha – love your wit lady – celebrating “Pi” day with a “pie”!!! And what a pie it is! 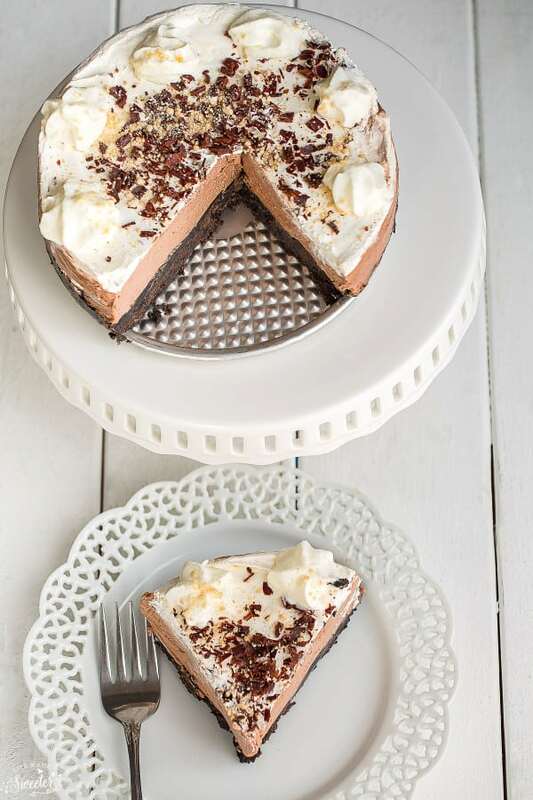 With its oreo crust and nutella/cream cheese/whipped cream filling – this pie takes “Decadent” to a whole new level! If I made this pie, I would save a slice for guests and eat the rest of the pie – the WHOLE rest of the pie – no plate needed! Hope your weekend is wonderful Kelly! Happy Pi Day Eva! Haha, thanks so much girl, wish you could come over so we could share treats – yours always look amazing and make me drool too:) Hope you enjoy the rest of the weekend! Oh man, this cheesecake pie sounds amazing Kelly! So many good things in one dessert! And I love that it’s no-bake – I think we all need desserts like this in our repertoire! Have a great weekend!! Pie on Pi day! No bake dessert! You have made my day! !Looks delicious!! So glad to hear that, thanks so much Cindy:) Hope you enjoy the rest of the weekend! This looks amazing!! My brother loves nutella!! Hahaha… and happy Pi day to u!! 🙂 What a fun (and delicious) way to celebrate!! 🙂 Hope that you have a great day! Thanks Katy:) Oh wow you’re right, that just reminded me that we used to celebrate it in math class too – haha, good times 🙂 Hope you have a wonderful rest of the weekend! I’m sure glad you’re celebrating Pi Day with this scrumptious pie! Those are some lucky visitors heading to your house. 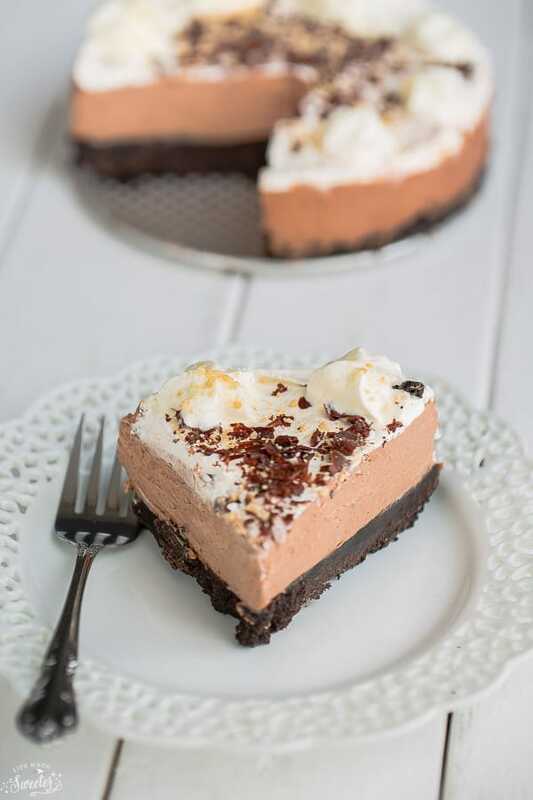 No bake options are such a fun change and when you have an oreo crust, Nutella, whipped cream (i.e., all the good stuff) in the picture, it’s pretty much irresistible. Oh my goodness! This sounds so good. I love that it’s no-bake and not time consuming. I have out-of-town guests coming tomorrow and your pie is a perfect welcome dessert. I looooveee nutella and could eat it out of the jar! And I also can’t believe you’re in the kitchen and you have a newborn!! This dessert looks great – Oreos and Nutella = heaven! Oh my gosh, Kelly. This looks so divine! You’re hit so many of my soft spots – oreos, turtles, nutella… all thrown together into the same pie is a recipe for success. Make it a super easy no-bake pie and I’m hooked! What a great looking recipe – I bet it’s so yummy! Aaw, thanks so much Lisa, you are so sweet and so glad you like it 🙂 Hope you enjoy the rest of the weekend! Thanks so much Jenn and thank you for pinning lady! Hope you have a wonderful rest of the weekend! Thanks Angie – haha that’s what I thought after the first bite too 😉 Hope you enjoy the rest of the weekend! Thanks Kelly, love whipping up fun treats for guests – totally the best part 🙂 Hope you enjoy the rest of the weekend! Thanks Jessica 🙂 Have an awesome rest of the weekend! Thanks so much Christin 🙂 Hope you enjoy the rest of the weekend! This pie looks soo good! Anything with nutella is going to be amazing for sure! Very clever use of nutella. Thanks for sharing the pics. Thank you 🙂 Have a wonderful rest of the weekend! Thanks so much Amy:) Hope you enjoy the rest of the weekend! Happy Pi Day Kelly! Really love the way this cheesecake pie turned out!! Nutella, oreo and chocolate all smacked into one! It must be super tasty! Thanks so much Sammie, so glad you like this 🙂 Hope you enjoy the rest of the weekend! This has to be the most decadent pie I’ve ever seen! You couldn’t have added any more delicious stuff ahhh so good. And the fact that it is so easy to whip up is awesome as well! All that goodness and Turtles in it too? I love everything about this pie! YUM!!! Pinned! So glad to hear that Kristi and thanks so much for pinning 🙂 Enjoy the rest of the week! This is fantastic!!!! I love turtles! And Nutella. Pinned! I love when you use Nutella, you always make me so hungry and happy! This cake looks super delicious! Aaw, thanks lady 🙂 Hope you have an awesome rest of the week! Thanks so much Emma and hope you have a wonderful rest of the week! You’re so sweet Renee, thank you so much 🙂 Hope you have a wonderful rest of the week! No bake? Really? It looks so delicious. 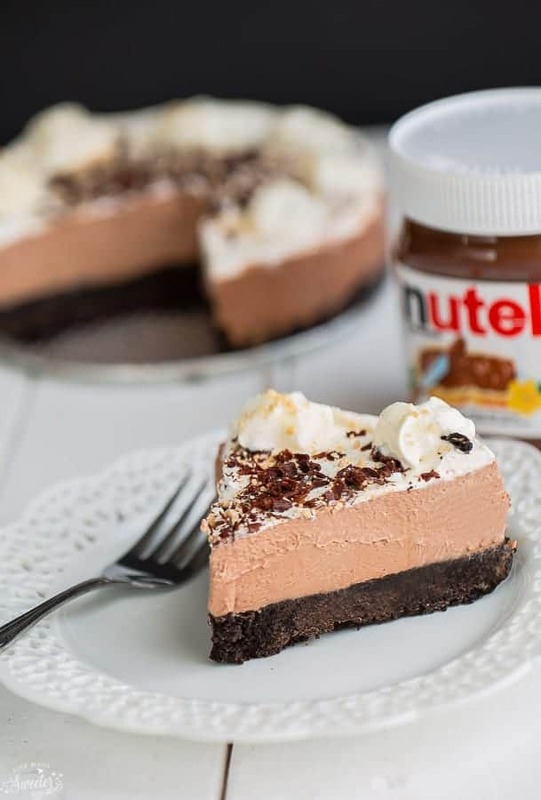 I love Nutella more than PB too, and this cheesecake pie sounds really good! Thanks so much Nami, I love Nutella more than PB too 🙂 Hope you have a wonderful rest of the week! lovin it’s not baked too, i think i should try this recipe!!! This pie sounds so delicious Kelly! I just bought a huge thing of Nutella from Costco, and am looking for ways to use it up so I don’t keep sneaking spoonfuls every day. haha! And hurray for no bake! Happy Belated Pi Day, Kelly, to you, to Evelyn, to your lovely boy and husband! I wish I made some pies that day, something savory or possibly a pot pie, but instead I had leftovers from the other day! 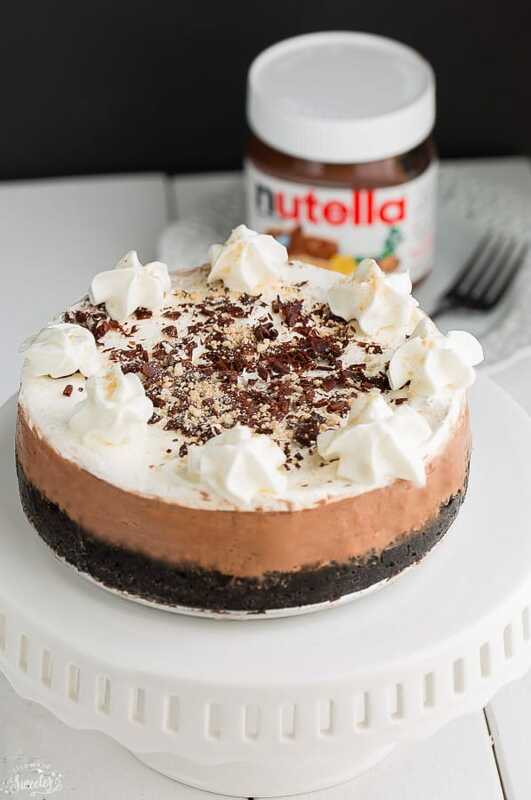 That No-Bake Nutella Caramel Cheesecake Pie is something my brother would devour in minutes, but I don’t mind eating Oreo cookies, ahhhh! He would eat anything and even loves vegan food! I like no-bake desserts, so easy to make without having to use the oven and other crazy baking tools! What a spectacular dessert! I can’t believe you have time to even whip up a no bake dessert with a new baby! You rock! Aaw, thanks so much Liz. You totally rock with all the treats and yummy food you post regularly even when things have been so busy in your household. Hope you have a great rest of the week! I love all the flavors and gooeyness in this pie! It’s heavenly looking…. how is the little one??? Oh sweet heaven! 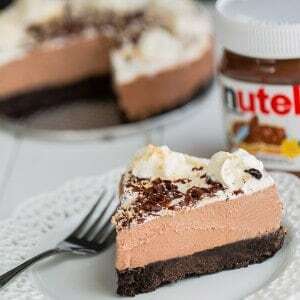 Anyone would be happy with such beauty in front and it’s with nutella! Thanks so much Gintare 🙂 Hope you have a wonderful rest of the week! I like the non bake aspect with the health addition of Nutella. Yes, please! This sounds amazing! Thanks so much Angela 🙂 Hope you have a wonderful rest of the week! Uhm, this is ridiculously amazing. Like, I just drooled on my laptop! Hahaha, that’s awesome, thanks so much Chris 🙂 Have a wonderful rest of the week! Thanks so much for pinning Kathy 🙂 Have a wonderful rest of the week! How simple and yummy does this look?? A huge Nutella like myself would eat, like, half of this! Hehe, I made this for my guests but had a hard time not wanting to polish this off by myself too 😉 Thanks for stopping by Lynna and enjoy the rest of the week! Cheesecake Pie! This looks amazing Kelly! I’ll totally be your guest! This pie looks so delicious Kelly!! Totally decadent and I love that it’s no bake! Ok, so I’m thinking I need some of this pie, like right now!! Totally swooning over this! Pinned! Kelly, this looks INSANELY good! I also love a good no bake dessert and the fact that Nutella is involved–well, I am sold 200%! Oh wow, this pie looks SO good and I love that it’s no-bake! No-bake pies are truly my favorite. And how thoughtful of you to have sweets out for all your guests and visitors – you’re a super mama! No bake? That looks amazzzzing. I have made many cheesecake, but never no bake. This cheesecake looks absolutely tempting! And it is with nutella! I will bookmark the recipe and make it later. Have a great weekend, Kelly! wow! must be a very busy time for you with a newborn! good for you for making something! great recipe Kelly! You must be the best hostess ever!!! Don’t be surprised when your guests keep stopping by just because they were “in the neighborhood”. I’d practically break and enter for this cheesecake!